After her mother died tragically, Pamela’s father threw himself into obsessing over how he was going to raise her. Though they prayed together every night, Pamela’s father micromanaged nearly every aspect of her life and kept her in a fundamentalist bubble. He determined that God’s will for her life was and wouldn’t let her date anyone until he hand-picks the first guy who comes to work for his archaic film ministry for her to hang out with. After being brainwashed all her life, Pamela goes along with it, even though this relationship has no substance, because she too must be the guardian of the fundamentalist-patriarchal flame. If you’re going to make a movie about patriarchal propaganda, the least you can do is make the production good. But no, Pamela’s Prayer sports a medieval production quality reminiscent of Bob Jones University’s Unusual Films (that’s not the only reason this movie is similar to those). It’s very cheap overall, including grainy video and audio quality, very pedestrian camera work, and an extremely clanky soundtrack that sounds like it was recorded in some tiny Bible Belt church (no offense). The sets and locations are severely limited (just like the minds of the writers), and there is absolutely no editing as the condensed life of an unsuspecting girl raised in a cult-like atmosphere is portrayed in just under sixty minutes. But that’s not all that’s wrong with this disaster. Pamela’s Prayer is not a fitting enough title, since this story is entirely centered around normalizing a creepy ideology of patriarchy that seeks to control every aspect of a girl’s life. Using completely empty and one-dimensional characters, including extremely perfect white Christians and very bad ‘worldly’ Christians (like Timothy Chey’s carnal Christians), the patriarchal worldview is shamelessly shoved down your throat. If you want people to convert to your cause, at least try to depict real people, not cardboard cutouts the spew talking points. also, try to actually write a realistic story that is accessible to most people, not some alternate universe portrayal of life. Nevertheless, this film is very legalistic propaganda that aggressively pushes an agenda and has no place in Christian entertainment. Hence, negative points are warranted. Once again, the Christiano team shows us how to distribute propaganda in the worst fashion possible. Choosing the most extremely white and awkwardly stiff cast possible, they fed the cast members lines and made sure they looked like good little white Christians, and that was about it. Line delivery and emotional delivery are very wooden and robotic, but this was probably mission accomplished for the Christianos. Yet people wonder why people cringe at the thought of Christian films. After watching a movie like this, one can only conclude that the people who push this sort of legalism on others also believe that those who are not perfect little white Christians cannot be redeemed or restored. The type of parenting that is portrayed in this film as good is exactly the reason why young people ‘fall away from Christianity’ or ‘lose their faith’. God didn’t tell Christian parents to keep their children in little fundamentalist bubbles all their lives or to micromanage every aspect of them, but to create a loving environment where the children learn Who God is (based on actions more than words) and how they can follow Him. Of course children need to be protected from harm and wrongdoing, but raising them in a cult-like atmosphere is equally detrimental. We need Christian families that actually care about each other, not dictate lists of specific rules to follow that are geared toward patriarchy and are designed to create little ‘perfect’ robots. If there’s one reason why a lot of people dislike Christianity, this movie embodies every aspect of it. Matt, Scott, and Jess are college buddies just trying to work for the Lord in the oppressive world around them. The atheists seem to have all the fun—they even have their own philosophy club (not God’s Club). Scott decides to challenge them to a debate when he discovers a groundbreaking paper written by a former student decades before that could upend everyone’s worldview. It tells of how the end of the world will come and though no one believes him at first, that’s about to change somehow. 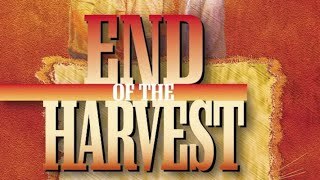 As a late 90’s production, End of the Harvest is very underwhelming. While camera work is okay, the video quality is very grainy and audio quality is less than inspiring, including weird sound effects. The soundtrack is loud and annoying. The sets are severely limited and cheap-looking. There is also no editing present as the entire story is presented at face value, with useless panning and zooming sequences. Essentially, with such low quality, there is little justification for this film being made, except for the fact that the Christianos needed an outlet to push their odd agenda. The first half of this film depicts characters sitting around talking about what’s going to happen in the second half of the film—thus, nothing much happens except for the same old rehashed conversations over and over again. The entire movie is less than sixty minutes long, so there’s not really much of an idea at all here. The second half of the film externalizes the bizarre worldview of the Christiano brothers that is mostly ripped off from Hal Lindsey and focuses on trying to predict the end of the world based on stupid Bible ‘codes’ and loose associations. They pick random verses here and there to use to their advantage but then passive-aggressively say they don’t really know if that could be true or not. Besides the fact that these stupid ‘scare people into Christianity’ arguments and absurd Biblical insinuations will convert no one, the characters are juvenile and the portrayal of atheists is embarrassing. This is the kind of garbage that makes people (including professing Christians) roll their eyes about the term ‘Christian movies’. As this film utilizes the typical lineup of David A. R. White, Kevin Downes, Brad Heller, and Lance Zitron, the acting quality is as good as can be expected. They seem like they are barely trying as their line delivery is rambled, slurred, and generally incoherent. Emotions are inconsistent and random. With such a small cast, there’s really nothing good to say here. As previously mentioned, there is no point in this film except pushing an agenda that is basically propaganda. This view of the end of the world is ridiculous and indefensible. It adds nothing to what should be the mission of Christian entertainment and only further detracts from it. The problem is that movies like this one are not from just some random, fly-by-night movie creators. The Christiano brothers are regarded as pillars in the field, for some reason. It won’t be easy to change this image of Christian film, but hopefully it is happening sooner than later. The year is 1890. Dr. Carlisle does the unthinkable and writes a seminary textbook advocating for the teaching of morals apart from Jesus Christ, Dr. Andersen sees fit to stall his vote for the book’s endorsement until Carlisle comes and sees his time machine invention. When Carlisle finally stops moping around and agrees to meet with the mad scientist, he is roped into travelling through time to the future so that he can learn what supposedly happens when society teaches morals apart from Christ. What he finds is a shocking new culture he’s not familiar with in many ways. Will he ever make it back so he can sell his textbook? Time Changer is one of those films that is very memorable, but for all the wrong reasons. While the production team should get some slight credit for attempting to dress characters in historically appropriate attire, there are too many other negatives that outweigh the small amount of positive. For starters, money was wasted building ridiculous time travel contraptions that look like they belong in a 1980s sci-fi film. The camera work and video quality are okay, but the audio quality is inconsistent, including a very annoying soundtrack. As usual, the editing is all over the board and is basically just a pasting together of heavy-handed scenes that demonstrate the Christiano brothers’ ridiculous worldview. Unfortunately, the production isn’t the worst this film has to offer. Time travel plots are always going to be a problem. There’s rarely an instance when this concept can be justified. But when you merge this mind-bending sci-fi premise with an extreme fundamentalist Christian worldview, disaster occurs. There is no plot present here, since the Christianos are content to shove their unwanted opinions on the state of humanity in your face at every possible turn. Who believes that if some crazy professor from the late 1800s discovered time travel, he would use it to ‘solve’ the world’s biggest theological nitpick? Time Changer is entirely built on the incorrect assumption that the ‘good ole days’ were better, when old white guys made all the decisions, women were not allowed to do anything but sit at home, and religious idolatry reigned. Thus, the dialogue is chock-full of religious jargon and fundamentalist talking points while at the same time making a mockery of anyone who opposes the assumptions of the writers. Besides this, in an attempt to be ‘historical’, the dialogue is also overly awkward and cumbersome. Because of this, the characters are extremely programmed and robotic, just waiting to spew their lingo when the time is right. There are also subtle racial stereotypes and jabs at modern women’s roles throughout the film. The ending of the film is borderline bizarre, as it quietly depicts the nutty professor trying to find the ‘end of time’ using his contraption. Not only do the writers silently let you know that they think the end of time occurs before the year 2050, but they also show disdain for Jesus’ own words in the Scriptures, which state that no one knows the time or day when He’s returning. In short, there is nothing good about this storyline, and it even goes far enough to be rated in the propaganda category. It’s purely preaching to a small audience that already agrees with these narrow-minded views and accomplishes little else. As can expected, the acting is as outdated as the ideas in this film. Line delivery is forced and awkward and emotions are not present. Male cast members are overrepresented while female cast members are painted in a strange light. As previously mentioned, there are also some subtle racial stereotypes. But what else is new about this film? This movie is a wide open window into the disturbing worldview of the Christiano brothers. In the end, they blame all of society’s ills on Hollywood. There may be some truth to this, as there are other nuggets of truth buried throughout the sludge of this film. Immoral Hollywood movies have certainly contributed a great deal to the corruption of society, but the world is always going to do what it does best—recede into sinful entropy. It is up to the Christians to stop this slide; we cannot expect the world to fix itself and pat us on the back for it. What people like the Christiano brothers really want is a return to their idea of a comfortably religious society. But what they don’t realize is that today’s culture is a reaction against that older worldview. If a white patriarchal religious utopia built on ivory tower theology was the answer to the world’s problems, it would have never ended. The problem is that those who claimed the name of Christ tainted His Name with their actions, not those who do not claim His Name. Jesus is the answer for culture’s problems, not some Pharisaical dominion. And when it comes to movies, if you don’t like what you see, make something better. So far, Christiano brothers and everyone else who complains about the state of Western culture, you have not produced any movies that are better or more worthwhile than the Hollywood alternative. So shame on you. Back in the Dark Ages of Christian film, when David A. R. White was a fresh new face on the scene and when the Christiano brothers competed with Bob Jones University and WorldWide Pictures for control of the market, this movie was borne. Depicting the iconic struggles of a perfect Christian teenager in an evil fallen high school world, Second Glance has been called ‘the best Christian film ever’ by dubious critics. This teen feels like he’s not making any difference at all, so he wishes the unthinkable—that he wasn’t a Christian anymore. He wakes up with this wish come true, so guided by a creepy angel, he is forced to take a second glance at his life. In this barely one-hour length extended short film, production errors are aplenty. Camera work is bad, including a lot of awkward tight shots, and video quality is very poor. The audio quality is replete with background noises that often drown out dialogue. Also, a stupid soundtrack blares constantly. The sets and locations are severely limited, and characters are awkwardly placed in them. Editing is virtually nonexistent, since they basically cut nothing from this film. They needed all the wasted time they could get to stretch this glorified skit into an hour-long ‘movie’. In short, there is nothing positive to highlight here. This movie might as well be called Randy’s Party, because that’s the focal point of the entire plot. This illustrious event, and that creepy King-James-Version-only angel that keeps following David A. R. White around are the highlights of the film. In this character-based coming-of-age biopic, the characters are extremely shallow. The high school kid White plays is extremely perfect and holds his universe together while everyone else is either beholden to his wisdom, neutral, or obviously wicked. This makes the entire premise of this film absurd and unrealistic. The dialogue that can be discerned is uninspiring. There’s really nothing else to say here except that this It’s a Wonderful Life plot concept has been thoroughly worn out at this point. Next time, please think through your idea before forcing it to happen. As previously mentioned, easily half the lines are unable to be deciphered, partially because of background noises and partially due to mumbled delivery. Emotions are awkwardly delivered, as with most things involving David A. R. White. Behavior is extremely obvious and forced, trying to drive home concepts that should be subtle (gee, that sounds familiar). As with everything else in this film, there is nothing good to note here. This is such a half-baked idea that it doesn’t even warrant creation. Couldn’t they have just dumped this one in the early stages? But no, Christian movies must be made at all costs! If you stand in the way, you are a persecutory extremist humanist atheist propaganda machine bent on controlling the minds of children. The world in this movie is portrayed as very bad and oppressive to Christians (an early David A. R. White concept), and Christians must stand up against it or something. Second Glance could almost be a prequel to Holyman Undercover. There is really nothing learned from this work, so unless you just want to watch the infamous final scene (depicted above), don’t waste your time. When Rachel Whitaker heads off to a ‘secular’ university to pursue a degree in pharmacology, she is immediately met with a challenge to her Christian faith as a biology professor informs the class that human life evolved from apes. Though she wavers in her convictions, her father quickly discovers her dilemma and confronts the professor, only to have the professor challenge him to a university debate on the issue of creationism versus evolution. As Rachel tries to talk her father out of the debate, he finds support from an unlikely ally as he digs deeper into the intrigue surrounding the professor. In the end, which side will triumph? For its many faults, at least A Matter of Faith scored one point for production quality. This is awarded for clear video quality and pretty good camera work. However, this is where the positivity ends. Audio quality is okay throughout, but some scenes are louder than others. The sets and locations are pathetic and scream low budget. The surroundings feel very plastic, like the characters are living in a textbook suburban city with no feeling at all. The soundtrack is glaringly amateurish. Finally, the editing is deplorable, just splicing a bunch of random scenes together that we’re supposed to believe are related in some way. Unfortunately, this isn’t where the negativity ends. Haven’t we had enough of the plot where the student is singled out for their faith by an atheist professor, especially with allegations of copying flying around? A Matter of Faith seems to go out of its way to create a false dichotomy between ‘creationism’ and ‘evolution’ and throws ‘science’ around like a Frisbee. The subtle message in the title seems to suggest that the creators don’t care about facts, just about destroying the atheist viewpoint at all costs. Don’t get me wrong—there’s plenty of problems with ‘evolution’ and we need a meaningful dialogue on this topic, but this film only insults people who oppose its worldview and attempts to scare those who might agree with it. Besides the philosophical concerns, there are many other problems wrong with this plot, which is actually just a collection of disjointed and unrelated snippets and scenes, mostly infused with an out of touch portrayal of life at a ‘secular’ university. The storyline does not flow at all as it hops from one thing to the next. The characters therein are highly stereotypical of a fundamentalist Christian worldview, depicting a controlling father figure, a wallflower mother, a confused younger woman, a heroic younger man, ‘bad boys’, and that evil atheist professor—basically the cast of Princess Cut on a college campus. The premise of the film is trumped up and makes a strawman of the atheist. However, the one thing that keeps this plot from going in the tank is a slightly interesting character concept that is wasted by the overbearing ‘plot’. But in short, A Matter of Faith is a mess that doesn’t even seem to try to be discreet or polite to those who oppose its viewpoint. This film has accomplished a rare feat. Whereas many independent Christian films are notorious casting actors and actresses without giving them any coaching, the cast of A Matter of Faith seems to be coached too much. This is evident in a general sense of over-acting, such as overdone enunciation of words and overly practiced body language. Cast members say their lines like they’re reading cue cards for a public service announcement. In an attempt to avoid glaring errors, the Christiano crew actually did not come out any better by turning their cast members into robots. Did the Christiano brothers actually expect to convert anyone to their viewpoint with this film? Is asking someone who believes in evolution if any of their family ancestors looked like apes (yes, that’s in there) truly a productive tactic to use? Is attacking psychology out of left field a winning strategy? We find it hard to believe that A Matter of Faith will even grow any Christians in their faith, as many are still confused as to what the real dichotomy between Biblical creationism and Darwinism (the truly dangerous philosophy) is. Creating a strawman out of ‘evolution’ is counter-productive and confuses people. Real people cannot relate to the events of this film, so it is likely that it will do nothing more than further fuel the fire of contempt between fundamentalist Christians and atheists. Dustin, Albert, and Mark are friends who stick together and solve the deeper problems of their 1970s small town. But one particular summer, they find themselves with a deficit of activities save for fishing and mowing lawns. That’s when they inadvertently cross paths with Jonathan Sperry, an elderly local man who takes it upon himself to teach them fundamental principles for living—including the truth about Christianity. Unknown to any of the three friends, their lives will forever be changed by the secrets they learn from the enigmatic Mr. Sperry. Jonathan Sperry had a higher-than-usual budget, and it mostly reflects in the production quality. 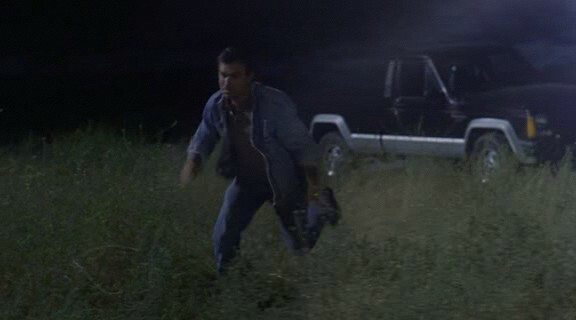 The camera work is pretty good, especially considering the high amount of outside scenes. The video quality is solid, as is the sound quality. Sets and locations were well chosen and props give the film an authentic historic feel. The musical score could have been better. The real thing lacking here is a game-changing factor. The editing is considerably good, but each production element just doesn’t quite live up to top standards. Something intangible is missing, yet it cannot be denied that Jonathan Sperry is still a step above most Christian films when it comes to production. Adapted from true events, the plot of Jonathan Sperry has a lot of great elements. The characters are authentic and many will be able to relate to them. The dialogue is simple yet profound. The events and circumstances they experience are believable and accessible. The storyline is non-linear and has some minor twists and turns. There is a clear Christian message throughout. Yet this being said, one could consider Jonathan Sperry to be overly realistic and too slow for viewing. There is some truth to this. The film lacks a dynamic punch that will really capture the widespread attention of audiences. Great care was obviously taken to be realistic, and this care shows, but we have to wonder if it is too authentic for its own good, so to speak. Nevertheless, the movie offers a poignant lesson for those who watch it and those who likely calm artistic plots will not find themselves disappointed. Similar to production, an air of professionalism is very evident. The actors and actresses are coached fairly well. Since the cast is small, it carries a large weight, and it does not necessarily stumble under it. However, there are some minor errors that could have been corrected and thus keep it from being all that it could be. But nonetheless, the acting puts many Christian movies to shame. There is a place for movies like Jonathan Sperry in the Christian film world, but unfortunately, films like this one will never be blockbuster. The truly unfortunate thing is that movies like this one are not the baseline of Christian-themed movies. This should be the starting point, not the improvement. Regardless, Sperry is something to build off of if only to showcase that the Christiano brothers understand the common man and that the only place they can go from here is up. On a small youth group retreat, Pastor Stuart senses that something is amiss with the group of kids he is responsible for. A new non-Christian girl is among them, and her presence is causing divisions among the Christian teens. He decides to try to get through to them by telling them his creative and family-friendly rendering of the Biblical story of Hosea and his tenuous relationship with his wife Gomer. Ultimately, each person must decide how they are going to respond and to show God’s unconditional love for all people. The Christiano Brothers and Kevin Downes usually know how to produce a movie so that it passes as above average. Amazing Love is no exception. There are few overt errors in this film’s production quality. The camera work is simple but not detracting. The video and sound quality are fine. The editing is fine, considering there is just not much content here. The biggest problems with production pertain to the limited and cheap looking sets. Some of the Biblical props and costuming seem low quality. Overall, Amazing Love is good enough to make viewers watch. The premise of Amazing Love is intriguing. Youth group issues need to be discussed in movies. Biblical narratives need to be explored. One has to wonder if Hosea was the best choice, but Box Office Revolution believes it was handled tastefully, even if it is slightly unrealistic. Due to the dual narrative, dialogue is simplistic and characters are shallow. The fact that there are two stories in this movie show that there is just not enough content to make this a dynamic film. But the creators did the best they could with what they had, and sometimes that is all we can ask. There are some interesting twists that keep the attention. This plot will make people think and it is better than a lot of Christian films. The actors seem either wooden or childish. Some of the acting is good, but some is not. The more experienced actors deliver their lines better than others. Casting might have been an issue in this modestly budgeted production. Overall, the acting is just average. Everyone needs to know that God’s love is unconditional, especially teenagers from broken homes. The story of Hosea reminds everyone that God loves even those we considered to be hopeless and unreachable. For a simple family film, Amazing Love passes the test. Audiences need to be informed of Bible stories that are not often focused on. Unfortunately, there was a low ceiling for this movie and it hit it. But in the end, this is definitely not a movie to be ashamed of.